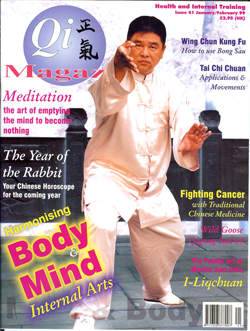 Since childhood, Sam Chin (Chin Fan-Siong) trained Kung Fu traditionally with his father, the founder of I Liq Ch’uan. He has won championships in T’ai Chi push-hands and kick-boxing tournaments, and is the Chief instructor of the system in U.S.A. Prior to his arrival in U.S. seven years ago Sam had taught for 16 years in Malaysia and Australia. He currently holds classes in Kent,NY at Chuang Yen Monastery and in New York City. QM: What is the meaning of I Liq Chuan? SC: I Liq Chuan literally translates as Mental-Physical Martial art. ‘I’ is mind, ‘Liq’ is strength, and ‘Chuan’ is fist so we can say ‘Mental-Physial Martial Art’. QM: How and where did this art originate? SC: My Father, Chin Lik Keong, learned the skill from one of the masters in Malaysia, called Lee Kam Chow. At the time it was called Hsing I-Pa Kua (Xingyi-Bagua), but some people called it Feng Yang Chuan or Liew Mun Pai (nomadic clan). It originated from Wudang mountain. It was a hidden martial art skill used by these nomads to protect themselves on the open roads and was not open to the public, only passed down secretly. The higher levels of skill were kept for the family members. When my father decided to trace back the history of the name to discover its origins, he found the training methods didn’t really look like Hsing-I (Xingyi) or Pakua (Bagua), or even Tai Chi Chuan, yet the contained the principles of all three. My father continued his research and expanded on what he had studied. He eventually concluded that what he had learned was an art of self recognition and self-realization, of both the mental and physical. So, feeling uncomfortable with naming the art under any one of the three internal styles he renamed it I Liq Chuan. In 1976 he formed the I Liq Chuan Association in Malaysia. QM: What are the principles of I Liq Chuan? SC: I Liq Chuan is based on Tai Chi and Zen principles. So you can say it has it’s roots in Taoism and Buddhism. It is based on non-assertion, non-resistance, and an understanding of yin and yang. The training is being mindful, which means neutral, formless and in the present, to become fully aware. Action and reaction are based on mental habitual reflex, which is the mental expressions accumulated through past experience. In this case you are not in the moment and not with the condition as it is (Tao). When you are in the moment you can flow. Flowing is to be with the conditions, not backing off, or resisting, just sensing and merging. From flowing you can observe the condition as it is, and then merge, to be as one, harmonizing with the environment and the opponent. When you harmonize then you can take control. Mindfulness is the cause, and awareness is the effect of being mindful. We need to understand the learning process, which is merely to recognize and realize; it is not to accumulate or imitate as that is just building another habit. From Zen we need to empty ourselves so that the nature of all things can reveal itself to us. Students train through a process. First they train to understand muscular movement, body structure and alignment. Then they train to incorporate Chi (Qi) energy, and the mental process. I Liq Chuan is an internal art. Its aim is to understand the inner feel and to express that inner feel outward. Relaxation is an essential component of the art. It contains the process of looseness, softness, elasticity and fa jing (issuing power). The energy released is from relaxation out, from zero to 100%. QM: How does the training progress? SC: The first process is the unification of the mental and physical. The second process is to unify with the opponent and the environment. Actually, in the beginning I Liq Chuan had no forms. It was a formless art. All the system contained was specialized sticky hands practice and Chi Kung (Qi Gong). The applications we learned from the sticky hands practice and the practice to gain feel. The system has expanded and now has two training forms, the 21 Form and the Butterfly Form. The forms are merely tools to recognize the principles, which are based on Tai Chi (harmonizing and recognizing the balance of yin and yang) and Zen (being mindful and being in the present moment). The objective is to actualize these principles to recognize and harmonize with the nature as it is. The second form, the Butterfly Form, has more fajin and is more aggressive. From the form, the student is taught to become formless. Every move is based on the conditions, with no fixed moves. Inner feel is cultivated first. You cannot attain the combative skill from just practicing forms. This is only possible through the two person practice of spinning hand / sticky hand drills. In training, to unify the mental-physical, we need to understand the nature of the mental and physical, how they affect each other and how to unify and coordinate them. Through the exercises we need to recognize the six principles which are relaxation; body alignment; center of gravity force; dynamic center of mass; internal and external circle (or force field of spheres of defense and offense), and the spinning force of coordination. QM: Can you Elaborate on some of the terms? SC: The dynamic center point of mass (located on the sternum) is that point to which we direct energy to achieve control of the opponent, where you make contact with the opponent, and by exerting a certain force, you can control his whole body. The force field of spheres is for offense and defense. It is the feeling of producing a roundness as in Tai Chi Chuan, or what they call ‘Peng Jin’ an expanding of the inner force. In I Liq Chuan the fundamental requirement is to be able to produce roundness, defending all round. If this roundness is attained then the movement can be properly born. From understanding the force field of offense and defense you must be bale to produce a three dimensional force, which comprises the horizontal, frontal and saggital. If you can produce the three dimensional force as a whole you can change with the change. you can call this primordial spinning force. From understanding and applying this force you will be more centered which means having your own spheres, the upper body peng, the lower body peng, back peng, the sides peng, all round peng. Only when the three dimensions are produced can the proper the proper movement be born, i.e. open, close, retreat or advance. Every action itself contains the three dimensions. With this kind of feel then you can flow and change without any kind of resistance. If the opponent cannot produce three-dimension force, he cannot change with the change and will be overcome because he is either resisting or collapsing. The spinning force of co-ordination is the spinning force that acts as our scanner. We scan and recollect the six aforementioned points to be centered, and keep extending these points to unify; at the same time, we are trying to clear mental and physical blockages and achieve the ‘mindful state’. Above all the practitioner must learn to break away from habit, to understand that the movement is not from the habitual relax and one should be conscious of the movement itself at all times. QM: What does the practice of spinning hands entail? SC: Spinning hands is the training awareness and harmonizing yourself with the opponent. From spinning hands we try to recognize that our movement is not based on habit but rather on the conditions. Spinning hands develops three sections; the wrist, elbows and shoulders. First we have to flow, which is to recognize and be with the opponent. Secondly we need to develop fending, which is to produces the feeling of roundness, which is a force-field of defense and offense that the opponent will not be able to penetrate. When you have flow and fend, the you can lead the opponent. When you lead him, you can control him; for when he begins to follow your movements, he belongs to you. So the progression is flow, fend, lead and control. When you can control the opponent then you can do whatever the conditions require. The training of spinning hands develops projection force, absorption force and splitting force. First is understanding the force from your feet up to the hands, to the opponent and down to the opponent’s feet. This is called the projection force. The second process is to lead the force from the opponent’s feet back down into your feet. This is the process of absorbing the opponent’s energy into you. The third is the split. At higher levels we can split our energy, while maintaining unity, at any point of the body we want. We can pick any place as the ground to exert power. Splitting is with more of the explosive power because the range is closer. QM: What would you say are the combat strengths of the system and how long does it take to aquire these? SC: I Liq Chuan develops the ability of redirecting and off-balancing. At higher levels of training there are strikes to the meridian points. Though there are some closed fist punches, mainly we use open palm strikes, qin na as well as elbow, knee and shoulder strikes. The most important aspect is controlling the opponent as soon as contact is made. Unlike many martial arts systems we do not concentrate on developing techniques for dealing with specific situations. Instead, we develop physical sensitivity and sensorial mental awareness so when an I Liq Chuan practitioner makes contact with any part of the opponent’s body he can feel what technique is about to be used and where the the opponent’s weight and center of gravity are extending. This skill is eventually developed to sense with absence of touch through awareness. When you confront an opponent you might find it hard to move his body using strength alone, but the mind has no weight and no volume, and it leads the body. So in I Liq Chuan, we learn to lead the opponent’s mind. When this is mastered, a woman or even a small child can easily overcome a big man by leading his mind, then his own mind leads his body. It normally takes about five years under my guidance to acquire a high standard and maybe three years to acquire good self-defense capability, providing the students apply what they have been taught in the class and practice regularly. QM: Is there anything further you would like to say? SC: The purpose of the training is not spinning hands or the form; it should apply to everything in daily life. Spinning hands and the form are merely a tool for developing mindfulness. It’s not like when you come to class to train and you wear a uniform and when you leave you take it off. When you train you train you learn to be mindful even at your job or when you eat, talk, walk, etc. Then more of life opens up to you as your perception of the causes and effects of the present has increased. The most important goal for a student learning I Liq Chuan is to attain total awareness and be themselves. Hopefully, my students will develop so that they can share with others. QM: Master Chin, thank you.